Moderator Dan Waters presided over meeting that ran for four and a half hours. West Tisbury voters gave lightning-fast approval Tuesday night to an $18.9 million town budget, then spent the next four-plus hours at their annual meeting carefully weighing a host of other articles, ranging from funding for the town picnic to sales of recreational marijuana to potential sites for affordable housing. The budget represents a 2.5 per cent increase over last year, but other approved spending would raise the town’s total need past the Proposition 2 1/2 cap and was contingent on voters approving a $400,000 budget override at the polls on Thursday. The last time voters were asked for an override was in 2004. But while voters took their time going through the 56-article warrant, most spending items were passed on voice vote with little debate. Voters easily approved a two per cent raise for town employees, repairs to town and school buildings, a new police cruiser and a vehicle for the fire chief, who has been using his own. A request for $2,500 for the annual town picnic was questioned then approved, but voters balked at spending $7,000 for three new parking spaces at town hall and refused to fund a $27,000 study of town speed limits. 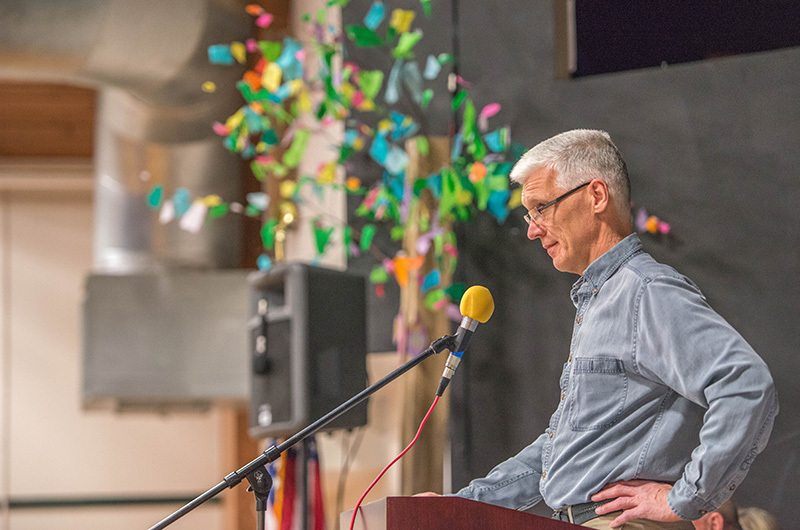 A total of 250 voters streamed into the school gymnasium where moderator Dan Waters opened the meeting just after 7 p.m. Emma Young, in her last year as town poet laureate, read a poem titled The Time, and by long tradition Mr. Waters read a list of 26 residents who had died in the past year, followed by a moment of silence. 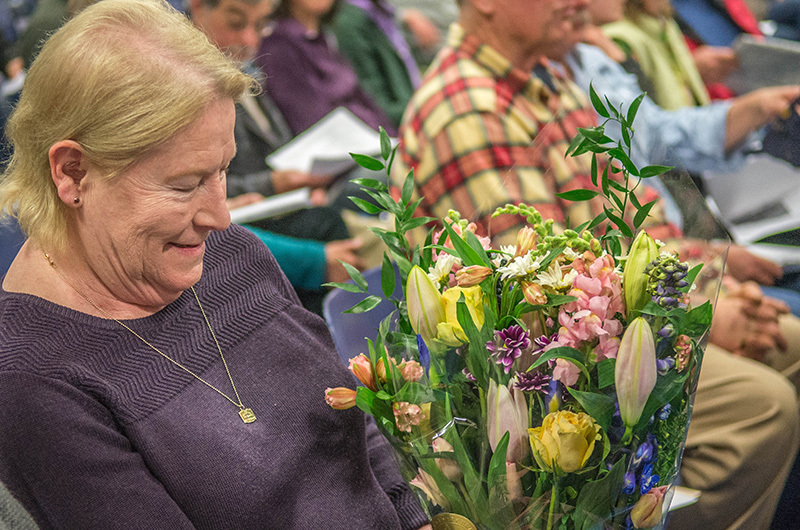 Two longtime retiring town employees, police chief Dan Rossi and tax collector Brent Taylor, received standing ovations, with selectman Skipper Manter coming down from the stage to present Ms. Taylor with a bouquet of flowers. The moderator exercised his prerogative to take up the 53rd article on the warrant out of order to begin the evening with consideration of a proposed ban on the release of helium balloons that had been placed on the warrant by petition by students at the West Tisbury School. 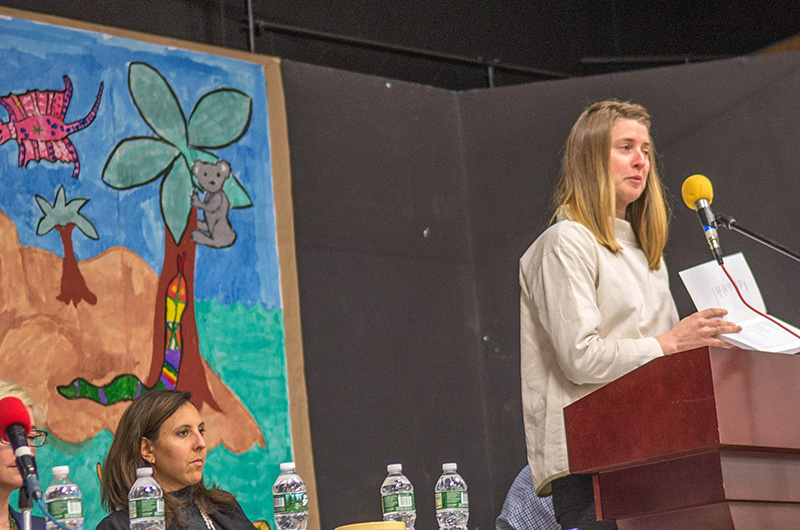 Vineyard Conservation Society director Brendan O’Neill and Claire Mone and Sydney Emerson, both sixth graders, took to the microphone to describe the ill effects of balloons on wildlife and the environment and urge passage of the ban. Voters enthusiastically agreed. Voters also approved a series of requests to help fund regional human service projects, but — in what became a recurring theme at the meeting — added a clause to its approval of up to $12,590 in funds for Adult and Community Education (ACE MV) to prevent other Island towns from “free riding” on its contribution. Finance committee member Doug Ruskin told voters that research showed that residents from two towns that did not participate in funding ACE MV last year actually used 50 per cent of its services. Voters considered a similar amendment to a request for $36,580 from county sheriff Bob Ogden as the town’s share of costs for the regional communication center, but the article was rejected entirely after Mr. Ogden confirmed that other towns had already refused to approve funding for the purpose. Two articles dealing with proposed sites for affordable housing sparked lengthy discussion. Residents of Old Courthouse Road urged voters to postpone consideration of a plan to transfer a building that once served as town hall and later a fire station to the affordable housing committee, citing traffic concerns and the building’s historic value. Selectmen had sought and received permission from the Martha’s Vineyard Commission to demolish the abandoned building if the town can’t find someone to move it. But Larry Schubert, chairman of the affordable housing committee, said his group would try to find a way to retain the building. “If we get control of it, we’d be the ones who you would say to, ‘don’t tear it down,’ and we’d be amenable,” he said. Voters approved the transfer by a vote of 180 to 25. But voters refused 125 to 25 to transfer the so-called Silva property at the corner of Lambert’s Cove and State Roads to the affordable housing committee. Andrew Woodruff, noting the site had been considered and rejected years ago for the new town hall, called the site “beautiful” and “vulnerable” and said any decision about its use deserved more consideration. “When you take away the reason people come to a place, you destroy it,” added Niki Patton. A zoning change was approved that would allow sales of recreational marijuana in the town’s commercial district by special permit. 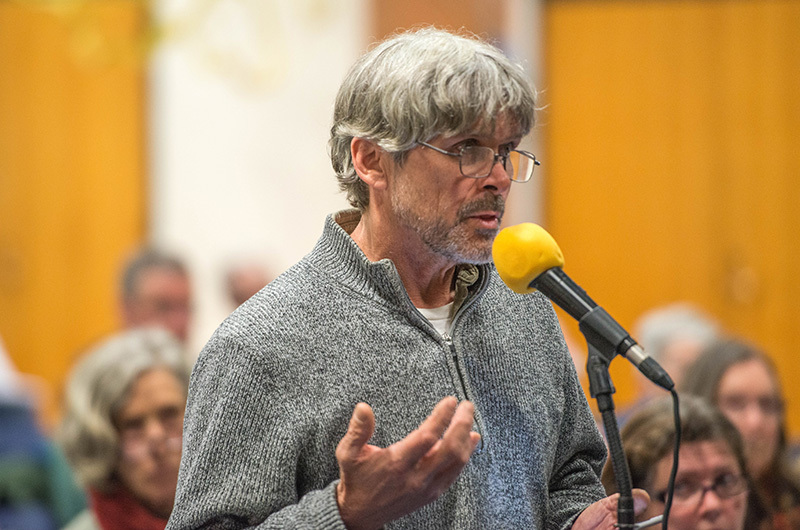 Resident Chris Egan argued that the move could make West Tisbury “the marijuana capital of Martha’s Vineyard,” but planning board member Bea Phear noted that the change would actually enable the town to regulate sales so that it did not become a home-based business. The crowd dwindled gradually as the meeting went into its fifth hour, but discussion remained lively. In their last act, voters unanimously approved a home rule petition to the legislature that would enable the town to put stronger restrictions than the state requires against the commercial use of herbicides in order to protect the water supply. With that, the meeting adjourned at 11:30 p.m.
More photos from West Tisbury town meeting.